Is the tornado of digital acronyms making you dizzy? This glossary of easy to understand definitions will help you and your staff demystify digital media. Courtesy of Crestron and AV Technology editors. CEC stands for Consumer Electronics Control. It was designed to simplify communications and control of HDMI connected devices. It allows up to 10 AV devices to discover and talk to each other via HDMI. CEC is intended reduce or eliminate the need for multiple remotes and button commands. CEC is a single wire bus inside standard HDMI cables. It is mandatory for HDMI devices to have CEC. While it is not mandatory to implement it, AV manufacturers have started incorporating CEC into their products. Inconsistent support among manufacturers has made it difficult to enforce industry standards for interoperability. If there's no control system, CEC offers simplicity and convenience. But CEC commands are automatic. They are programmed to occur whether you want them to or not. So, if you have a distributed AV system or a control system installed, the CEC data can interfere with the functionality of the system. DisplayPort, released in 2008, is the latest generation interface between computers and monitors. The DisplayPort standard was developed to provide a single high-bandwidth digital interface for the laptop and desktop computer markets. DisplayPort is both an internal firmware, or "chip to chip" technology, and an external transport technology, often referred to as "box to box." Historically, there have been three different interface technologies used in PCs. VGA and DVI for connectivity to external monitors; and LVDS for connectivity between the internal display driver of a laptop and its embedded LCD screen. Because it can support both internal and external communication, DisplayPort can replace the other three. VGA, DVI, and LVDS all have limitations, such as transmission distance, clock speed and bandwidth. DisplayPort resolves most of these issues. As a packetized protocol, DisplayPort carries its own clock within the data stream. This eliminates skew issues and requires fewer wires. Packetized data uses available bandwidth more efficiently, so DisplayPort can handle higher resolutions and more types of audio, video and data than VGA or DVI. Similar to HDMI, DisplayPort consolidates signal transmission into a single cable and supports full, uncompressed HD video—1080p and Deep Color—as well as HDCP content protection and multi-channel audio. On the other hand, DisplayPort does not support CEC device control or Dolby and DTS 8-channel audio. Today, many PC laptops and MacBooks feature only DisplayPort outputs; VGA and DVI ports are disappearing. Most HD video displays offer only an HDMI input. So, a converter cable (otherwise known as a dongle) is needed to connect a computer to a video display. The DisplayPort chip inside the laptop or computer detects the connected dongle and automatically converts the output signal to HDMI. It is common today to have computers as content sources, both at home and in the office. So, the need to manage PC and Mac-based media is growing. DVI is the oldest of the digital video technologies. It was release by Digital Display Working Group in 1999 as a royalty-free specification. The specification has not been revised since it was first published. DVI is available in three varieties: DVI-A (Analog), DVI-I (Analog and Digital), and DVI-D (Digital). DVI-D provides video only and can support 1920x1200 video with a single-link connector and 3840x2400 with a dual link connector. 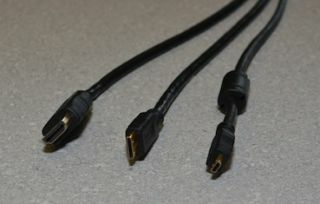 DVI is the most common digital connector you will find on desktop computers and supports HDCP. DVI video is directly compatible with HDMI. The DVI specification does not provide a cable length limitation however there is a functional limitation of 15 feet at 1920x1200 resolutions without a booster or repeater. Lower resolutions, such as 1280 x 1024, may work over cable as long as 50 feet. EDID stands for Extended Display Identification Data. EDID is information that a display sends to a source, telling the source its native resolutions. The source then analyzes the data and sends the best audio and video formats that the display supports. HDMI, DVI, VGA and DisplayPort are able to transmit EDID. Analog signals cannot. So, for example, when a Blu-ray player is powered on, it reads the EDID from the display. The EDID could report that the display is a Samsung 32-inch LCD with a 1280 x 1024 native resolution; it supports 480p, 720p and 1080i video formats and it's an HDMI device with two-channel audio. The Blu-ray player compares this information with what it can output and sends 1080i video with stereo audio from the HDMI port. EDID was designed for single point to point communication. It was not intended for distribution. So, what happens when you want to send that Blu-ray movies to multiple displays? What if the displays have different audio and video specs? Some HDMI switchers will collect EDID data from all connected displays, and then send the lowest common resolution to the source. Other devices manage EDID by copying the data from one display and pushing that resolution to all displays. So, if the first output is to a 1080p display, then 1080p goes to all displays—even if they can only support 720p. This will result in a blank screen, or even damage lower resolution displays. On the other hand, if the first output is only capable of 720p, then that's what gets sent to your full 1080p display too. There is no standard for managing EDID. How EDID is managed is important for the performance and functionality of your system. One of the major challenges of working with digital technologies is that the majority of technologies are limited to 50ft cable lengths without repeaters or boosters. HDBaseT is an emerging technology which provides the ability to run video, audio, network, power and control with HDCP support over a single Cat5e/6 cable at 330ft. The first HDBaseT products have begun shipping and the interoperable nature of this technology provide for interesting possibilities. Alternatively the majority of major AV manufacturers offer proprietary digital switching and extension solutions using twisted pair and fiber cable. HDMI stands for High-Definition Multimedia Interface. HDMI is a port, a cable and a transmission technology. Originally, HDMI was developed as a means to transmit digital HD audio and video on a single cable from a source, such as a cable box or DVD player, to the display. As a simple point to point solution, HDMI was designed to only go about 50 feet. Today, it is the standard format for handling HD signals, but HDMI presents real challenges as custom installers and customers try to distribute these signals—something that HDMI was never intended to do. Unlike analog AV, HDMI is bidirectional and the cable includes 19 wires rather than one to five, depending on what type of analog signal you're transmitting. HDMI cables come in pre-fabricated lengths from 6 to 50 feet. Bulk cable is not currently available due to the distance limitations. Also, similar to RCA or S-video, the connectors do not lock in place. HDMI carries multiple audio and video formats including full, uncompressed HD and multi-channel audio. HDMI can transmit either surround sound audio or two-channel stereo, but not both at the same time. HDMI also supports two-way communication protocols such as HDCP, EDID, and CEC. It is the worldwide standard for HD signal transmission. Along with fiber and DisplayPort, HDMI is the only way to handle true HD. However, distance limitations, cable installation, and two-way data management have frustrated custom installers and consumers, slowing full adoption. HDCP stands for High-bandwidth Digital Content Protection. It is a form of digital rights management developed by Intel. Content protection was mandated by the FCC at the request of the movies studios to prevent piracy. By blocking illegal distribution, HDCP has prevented all signal distribution. This has caused some frustration among consumers who used to watch movies in rooms throughout the house, but now they can't. HDCP handshaking also causes the delay when changing channels on your HD cable box or satellite receiver. High-Definition Serial Digital Interface (HD-SDI) and 3G-SDI are widely used in the broadcast world to transport high-definition video. Both do not support HDCP, and can be limited in their support of computer resolutions. While there may be need for HD-SDI in AV systems that interface with broadcast systems or have heavy video requirements, it will not provide the functionality required for the majority of presentation or classroom systems. This refers to wireless video and audio in the 60GHz band. Compatible with HDMI. Wireless Display (WiDi) is an Intel proprietary technology which uses provide wireless video and audio over WiFi. Version 2.1 HDCP. A set of IEEE standards to provide traditional AV routing over Ethernet. Marketed by the AVnu Alliance. Learn more at avnu.org.